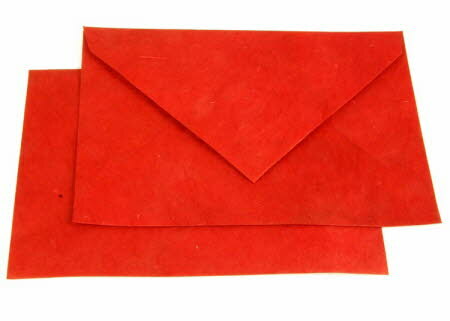 Bright Red C6-size handmade lokta paper envelopes to match our Red paper from the Vibrant A4 Computer Paper range (http://www.wildpaper.co.uk/html/vibrant_computer_paper.html). This handmade envelope is 114 x 162 mm (approximately 4 1/2 x 6 3/8 inches) and holds an A4 sheet folded twice into quarters or an A5 sheet folded in half. This is the most common size of envelope for domestic use and is very easy to fold the A4 letter paper into the envelope. Remember that these are handmade envelopes and that the exact sizes may vary but there should be adequate clearance to ensure that A4 handmade computer paper will fit.